If you know anything about Broadway plays, you know that right now "Hamilton" is the most sought after ticket in town. I'm told that tickets are selling a year out. I understand why the musical is so popular because my daughter and I saw it last July when I was in New York City for the Romance Writers of America Conference. Here I am standing in front of the marquee before we went into the theater. This is a photo of my daughter and me during intermission. You might be able to tell we sat in the front row of the balcony. The gentleman in the row behind us was kind enough to take the photo. I didn't want to attempt a selfie. When I registered for the NYC conference almost a year ago, I knew there was a good chance that my daughter who lives in Baltimore would love to come to NYC for a Broadway show. Several times a year, she goes to NYC to take in a show. So I told her to pick out something for Wednesday afternoon. She told me she wanted to see Hamilton, but she wasn't sure that I would like it because the music is mostly hip-hop and rap. I told her I was game, even though it's not my music of choice, because I love history. As it turned out, Hamilton was just starting it's Broadway run, and we couldn't get matinee tickets on Wednesday. We could only get Wednesday evening tickets. My problem. I was part of the RWA Literacy signing from 5:30 to 7:30. Thankfully, since the theater was just steps from the hotel, we were able to get to the theater for the eight o'clock show. I enjoyed "Hamilton" even more than I expected. I even cried at the end, something that took me completely by surprise. I had no idea that Hamilton played such a big part in the American Revolution. I mentioned to my daughter that the story made me want to read more about his life. So for Christmas, she bought me the book that inspired Lin-Manuel Miranda to write the musical. As you can see from the thickness of the book, I won't be finishing it in a day or two. What does this have to do with writing? Characters. The musical is filled with characters that the composer brought to life. He brings history alive. Every writer wants to let the reader share in the character's journey. Here are few clips from "Hamilton." Have you seen a Broadway play or musical? What did you like best about it? 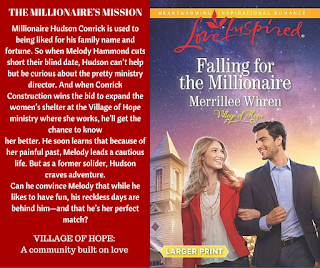 I will be giving away copies of the first two books in my Village of Hope series to one person who leaves a comment. Look to the right and subscribe today. Merrillee Whren is the winner of the 2003 Golden Heart Award presented by Romance Writers of American. She is married to her own personal hero, her husband of thirty-five plus years, and has two grown daughters. 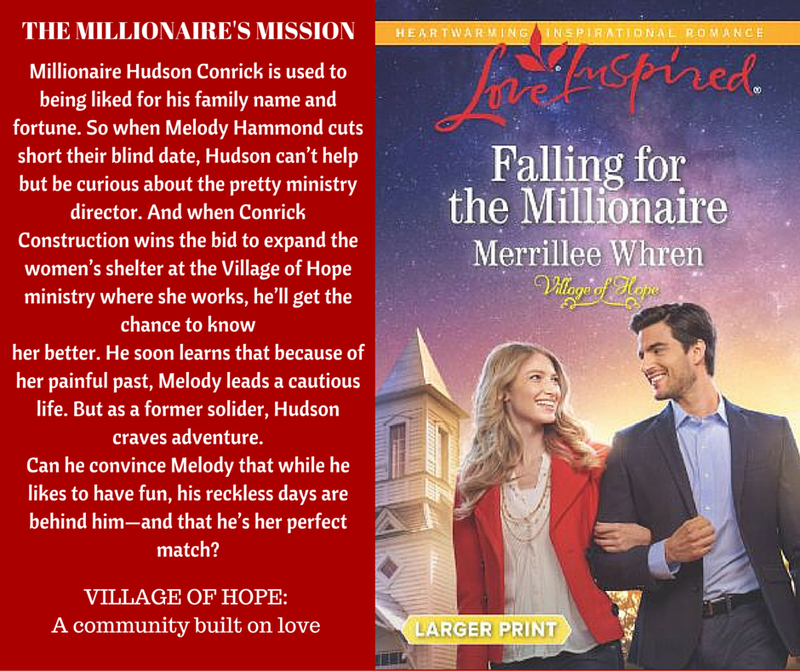 Her upcoming release, Falling for the Millionaire, will be available around March 22, 2016, at all major book retailers. You can find the pre-order links at her website. Connect with her on her Facebook page and sign up for her newsletter. Mel, it's so nice that traveling companies tour the US so we can see Broadway plays. The best touring show I've seen was the "Lion King." How fun! I love plays but where I live there are very few. Deanna, what instrument did you play? Karen, thankfully, I've lived in towns where at least we could see the touring companies that put on Broadway plays. My entire family loves musicals. (We're all musicians.) My son has raved about Hamilton and we hope to see it in NY city this upcoming summer. Josie, you should start looking for tickets now. They are hard to come by unless you pay a ticket broker a hefty sum.